On 27th of April a spontaneous wildcat strike broke out in Musgrave warehouses in Dublin. The whole crew, around 80 people, both immigrant and natives - in solidarity stopped their work after successive acts of discrimination by the management. Musgrave is a big Irish corporation, which owns Cetra and Supervalu in the Republic of Ireland, Londis and Budgens in Great Britain and other networks in Spain. In their warehouse in Dublin, where the strike started, immigrants make up around 50% of the staff, officially employed by work agencies and hired by (or rather rented to) Musgrave. Many of them are Polish. Agency workers are continuously discriminated against by managers, their working conditions are definitively worse, they're paid less and haven't got any rights. Their situation was getting worse week after week. Some of the them joined the Independent Workers Union, a few joined SIPTU, the biggest union in Ireland, of which all the Irish staff employed directly by Musgrave are members. On the day of the strike, one of the managers gave out a new work schedule for the agency workers. Workers' breaks were cut short and they were expected to work for four hours in a row, in temperatures of around 4 degrees Celsius! At the same time, contract workers kept their right to a break every hour. The same day, one of the agency workers was fired because he couldn't find a pallet with the article that he was meant to distribute. Although that the mistake, as it was noticed, was made by the manager, he stuck by his decision, and sent the worker home for no reason. This discrimination was too much for the workers to take. At around 7pm the agency workers stopped working and moved to the canteen. 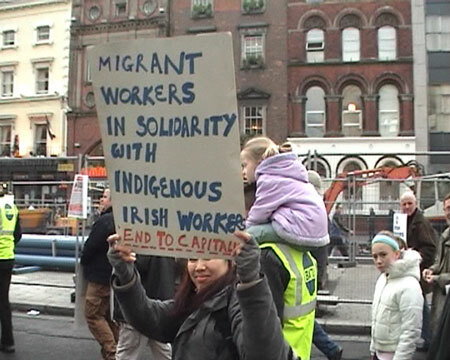 After a few minutes the Irish workers joined them, loudly showing their support for the strike. After less then an hour, representatives of the three agencies which supply workers to Musgrave came. Using threats and pleading they tried to convince the workers to come back to work, but they got hissed. Soon after that the representatives of SIPTU and the agency workers unionised in IWU came. The first of them tried to use a tactic of compromise, underlining the alleged illegality of the strike. He tried to bluff people into believing that they can achieve anything with negotiations and legal steps. But he didn't manage to convince neither the agency workers nor, what's even more interesting, contracted workers from his own union. The IWU representatives called for the continuation of the strike and for a firm set of demands. Soon he was removed by security on the order of Musgrave's chief. He was meant to say that only SIPTU is operating in the warehouse and no other unions had the right to be there. In response the agency workers refused to agree to negotiations and stayed in the canteen. Meanwhile the IWU representative, 65-year-old Ray O'Reill spent about 2 hours waiting in front of the warehouse gates. At the same time, Musgrave management, together with the SIPTU representative tried to convince agency workers and Irish workers remaining on their side to come back to work. They threatened everybody with loss of work and illegality of the strike. Workers unionised in SIPTU successfully countered the arguments of their leader, and continued to support their friends from agencies. In the end the whole group of agency workers that wanted to meet the IWU representative left the site and went to meet him outside the gate. It was agreed there that the night shift is going to go back to work, and the rest goes back home. It was also decided to postpone any further actions to Tuesday. Then, agency workers of all shifts are going to come to Musgrave together for the talks with the management. Earlier in the canteen, both Irish and immigrant workers agreed that it is a common fight to maintain the achievements of the union movement and their high standards of work. Not long ago MUSGRAVE tried to cut most of the privileges of their workers just to mention the seek leave. In response to that SIPTU broke the negotiations. It's obvious that this fact also influenced the Irish workers, as they know very well that "cheap labor" from the new member countries of the EU may take the good work conditions away from them. The strike ended half an hour after midnight. If on the first of may, Tuesday, the workers won't succeed in getting equal rights and employment conditions as the Irish workers have, the protest is going to be continued. Written by Polish IWU members.